Well my “under 20 min a day “watercolours have gone by the way as other things have cropped up. Getting more silk and encaustic pendants done for a couple of galleries has been a high priority and of course classes and a few family things like “mothers’ day” and my sister’s 60th birthday. Today’s class was a repetition of one I took a few weeks ago as a couple of people who were present today had missed it. 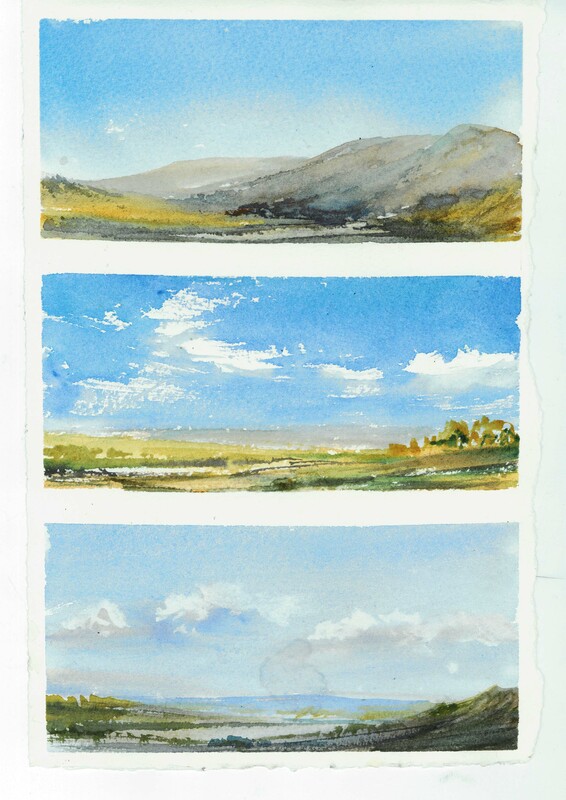 The topic, simple skies, as for a landscape artist skies are critical and in watercolour they are created so beautifully. We used an eighth of a sheet Saunders 300gsm rough paper (good for dry brush and for lifting colour if needed). Two blues… cool and warm, a neutral red like brown madder and a yellow (raw sienna is a “safe” yellow). Dividing the paper into 3 sections using narrow masking tape, the sections are easy to work and view the behaviour of the paint and water across the whole section. Important when learning. 90 % of each work is done with a soft goat hair, one inch hake brush. This encourages broad sweeping strokes and reduces the temptation to push the paint in a controlled manner. This entry was posted in Art Classes, demonstrations, painting, Tasmanian artists, Tasmanian landscape, watercolour and tagged glacial terrain paintings, painting skies, simple watercolour, watercolour, watercolour beginnings, watercolour skies.